Pennsylvania State University World Campus has launched an online education program geared toward working professionals who want to earn a master's degree or graduate certificate in geodesign. 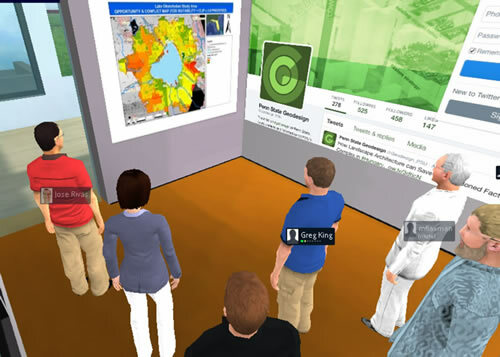 Students collaborate on assignments in a 2D/3D virtual classroom—at times using avatars—where they learn to make geospatially oriented design decisions. Read the article. View a map of geodesign education programs in the United States. Avatars representing the students enrolled in the Master of Professional Studies in Geodesign program at Penn State meet in an online virtual classroom to discuss a project. Learn how to use a drawing option in ArcMap, called Match to symbols in a style. This matches symbol names to attribute values to automate the process of assigning symbols to features. Symbols on your maps will be consistent, and the process of symbolizing features will speed up. Read the tip. Online education programs like Penn State University's Master of Professional Studies in Geodesign gives busy working professionals like José Francisco Rivas Valencia of Mexico and Greg King of Australia a golden opportunity to learn new planning strategies. Read the article. The Register of Deeds office in Racine County, Wisconsin, created a series of Web GIS apps that the public can use to view land records information. Read the article. Want to build Web GIS applications without doing complicated programming? 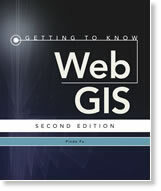 Developer Pinde Fu shows you how in his new workbook, Getting to Know Web GIS, second edition. Read the article. Thanks to a new partnership between Esri and Waze, government organizations can now use traffic data that Waze users collect in the ArcGIS platform. Waze is a popular crowdsourced traffic and navigation app. Read the blog. Learn more. Beth Christenson, from the City of Cincinnati Police Department, explains how her organization uses ArcGIS Online to analyze crime patterns and provide situational awareness. Watch the video. Greg Brown, the GIS manager for the City of New Braunfels, Texas, talks about how Web GIS apps and an open data portal benefit both city staff and the public. Watch the video. More than 4,000 federal government professionals will converge on the Walter E. Washington Convention Center in Washington, DC, from February 13–14, 2017. Sign up soon. Familiarize yourself with the various sections of the Esri Story Map Cascade app, such as the cover, sequential and immersive sections, titles, and credits. Find out what type of choices you will face when creating one of these apps. Learn more. You can use ArcGIS Pro to view 2D and 3D representations of your data simultaneously by docking map and scene views side by side. Read the blog. Follow these steps to prepare your data for use in Esri CityEngine, the software that gives you the ability to create a 3D model of a real city. Read the blog. David Cardella, Esri's product manager for developer technologies, answers 10 questions from developers about developing apps using the ArcGIS platform. Watch the video. Use ArcGIS Pro to create your own 3D scene and animation of naturalist Alexander von Humboldt's expedition to South America in the late 1700s and early 1800s. 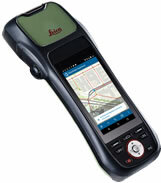 Take the Learn ArcGIS lesson. See a finished version of the animation. Explore the craters and volcanoes of Mars and see what the Red Planet would look like if water flowed there using the interactive (Is There) Life on Mars? web map. Go to Mars. Thanks to contributors, the large-scale map layers in Esri's online basemaps keep growing and improving. You can find building footprints, railway lines, trees, neighborhoods, points of interest, and more, for places such as Aurora, Colorado; Pulaski County, Arkansas; Moorhead, Minnesota; and Ohio State University. 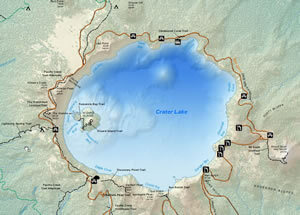 View the maps in an Esri Story Map Journal. Esri education manager Joseph Kerski offers five handy tips on how to make working in ArcGIS Online very easy. One of his recommendations is to name data layers descriptively. Read Kerski's blog.